The Aurora AS1225CD is a cross cut paper shredder that will shred up to 12 sheets of paper at a time into 4 x 55mm pieces. It will also shred one credit card or destroy one CD at a time and if small paper clips or staples find their way into theshredder it will shred these to.The AS1225CD has a large 25.4 litre pull out waste bin which is very easy to empty and there is a viewing window built into the handle to show when the waste bin is getting full.Castors on the base of the shredder make it easy to move around so the shredder can be easily relocated. 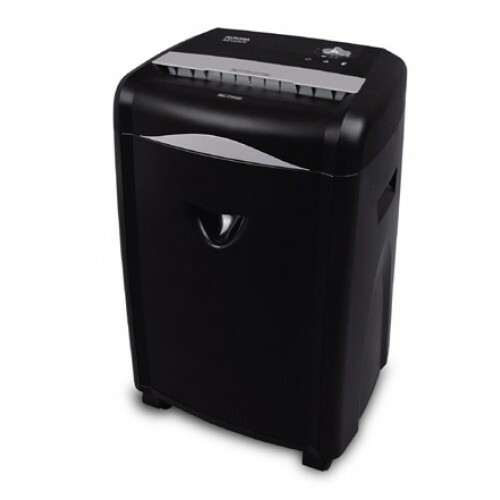 The AS1225CD is ideal for offices and users who require a secure cross cut shredder with a large pull out waste bin.